Breathtaking water views from this beautiful villa perched high on the coastline of Terres Basses. 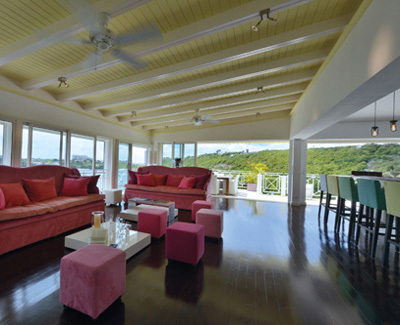 The colorful and generous interior spaces show a creative fusion of the contemporary and the traditional and include a spacious open-plan living and kitchen area with unbroken view over Simpson Bay lagoon to the ocean beyond. Grand View has 3 air-conditioned bedrooms with beautiful en-suite bathrooms. The master suite also has its own lounge area. This is the perfect location for families with older children or for couples traveling together.